I thought today was going pretty good until I got in the car to go pick up Kyndra from the sitter's. Wouldn't you know that More Beautiful You came on so I sang along with Carleigh's version of the song. Of course, I couldn't make it completely through the song and the last line of the bridge always gets me. I choked down a sob as I felt the tears start to fill my eyes, but they didn't fall. At least not this time. Gosh, things just hit you all of a sudden and try to knock you down. I watched a video of Mandisa's He Is With You at HappyascanB. I've never heard this song before and wow is it good. I had to choke back another sob when I heard the line "He is with you when your baby's gone". I want to share this video with the rest of you but not with the intention of making you cry but because it is a good song. There were a couple other things that I choked up about but I'll just leave them be. 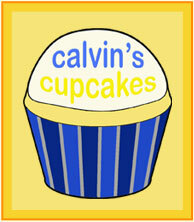 I got the Friend Award and A Lovely Blog Award from Karen @ On Having Faith. I'm feeling up to it now so I thought I'd share a few honest things about me. They may or may not be new to you. Maybe I can come up with 10. 1) I've only painted my nails a couple times in my life. I didn't even do them for my wedding. I just prefer them plain. 2) I love my job and while I love being a mommy more, I don't think I could ever be a SAHM. Part time would be perfect. 3) I hardly ever make our bed. I get up several hours before Anthony and I know he isn't going to make the bed. Sometimes though he does pull up the comforter to make it a little neater. 4) You know the person that seems to know everything and has a bunch of useless knowledge? Yeah, that's me. 5) I wash my hands and use hand sanitizer like a million times each day (slight exaggeration). Not because I'm a germaphobe but because I work in healthcare. 6) I love helping others. I wish that I could always do more. 7) I'm a Twilight addict and it has led into liking other vampire stories too. Well, there's 7. I guess that's good. On Saturday, many people who wanted to honor Harley released balloons at 1 pm CST. It was so wonderful knowing that so many people were doing the same thing at the same time as me and thinking of Harley and her parents, Katie and Cameron. I was at the Columbus Zoo when I released Harley's balloon with Kyndra. The purple balloon stayed tied to the stroller until it was time to let it fly into the sky. Harley, you are such a beautiful little girl and your legacy will live on through those who loved you. We will never forget you!! Don't forget to chip in for Harley! Anyone who participated in the balloon release and posted about it please enter the link to your post below so that we can all visit each other's blogs. If you created a bedroom for your baby tell us what it was like. Did you have it ready for them before they were born? If so how did you cope coming home to it without your baby? Did you pack it all away? What is your baby's room now? If you lost your baby after they had come home what is it like going into there room now? If you are trying to conceive again, or are pregnant again how do you feel about setting up another room before your baby is born? 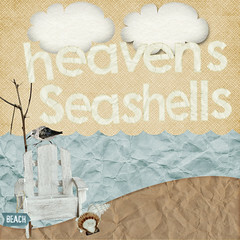 Before Carleigh's diagnosis I had no plans on creating a bedroom for her. I had planned on keeping her in our room for the first 6 months just like I did for Kyndra. By the time she would need her own room we planned on living in a new house. She would be in the crib that Kyndra used with the same nursery theme, which was Sea Life. Well, once we got her diagnosis all that went down the drain. We made no plans to move and Kyndra still sleeps in her crib. My plans are still the same for our next baby. They'll stay in our room for 6 months and then move to the crib with the Sea Life theme. I intentionally bought a neutral theme when I was pregnant with Kyndra so that I could use it for all of our future children, whether they be boys or girls. We'd also like to move to a different house by the time they would move to their crib. On another note, I got a lovely surprise from Freja's mommy. She wrote Carleigh's name in the sand. Thank you so much Holly! Yesterday it was 5 months since Carleigh's birth. The day went pretty well. The night before I got a package in the mail that contained the Comfort Bears and the Dreams of You memory books Kelly was sending me. I took them into work and gave them to the Mother Baby Care Unit for families suffering a loss. 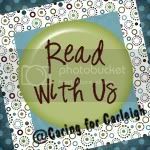 How fitting that on an anniversary date I was able to do something to help others in Carleigh's memory. The only thing I forgot to do was write letters for the parents that would receive them but I noticed that Kelly provided her blog address and mentioned Walking With You so that made me feel better. I don't know how I managed to forget to do that but I did. After work I had every intention of heading straight to the cemetery but I realized I was going the wrong way when I was halfway through town so I turned around and on my way to the cemetery I stopped at Swindler & Sons Florist. I thought I'd like to get a flower for Carleigh. So I went in and I got a flower and I went ahead and got my purple balloon to release in memory of Harley (you can still chip in!). I called Anthony to see if he wanted to go out to the cemetery with me and he was home at that point so instead of going out to the cemetery I went home and got Anthony and Kyndra. Then all together we finally went out to the cemetery. I got an invitation from my blog friend Jenilee earlier in the week for a girl's night out with her awake group and I wasn't sure if I wanted to go seeing that it was an anniversary date (I contemplated staying at home to mope) but I had decided earlier that day to go. So once I got home from the cemetery I got ready for that. I'm so glad I went. It was a great time. The day before Carleigh's 5 month anniversary I got a lovely email from Tim that I really appreciated. (Thank you Tim and Carey!) I can't begin to tell you how nice it is when someone remembers such an important date. Tim also sent me a couple pictures and here is two of them. One is Carleigh's name on the fridge, which his daughter Taylor did and the other is Carleigh's name in the sandbox. Even though these pictures aren't on a beach they still mean a lot because I know the love and thoughts behind these actions. I don't remember where I got the idea but a while ago I read something about someone getting their medical records and having them as sort of a keepsake. I thought that it was a pretty good idea. Medical documentation of my daughter's life. I kept the idea in my head but it kept getting pushed back in my head until I almost forgot about it. I don't know what made me remember but on Tuesday it suddenly came to me to actually do it. So I did. 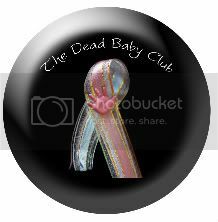 Now I work in the same hospital where all the records of Carleigh's scans and my labor and delivery were so on my lunch break I went to the Medical Record department and requested them. There were around 40 pages so I went through them and picked out the ones I wanted. I would've taken them all but you have to pay per page and at $1.50 per page it would've been quite pricey to get them all. (And that was even with my employee discount!) Some of them were ones I prolly wouldn't want anyway, like Nutrition and my discharge instructions. I only really wanted things that were about Carleigh. So I went through them and selected 18 of them. Most of the ones I picked were ones that documented the progress of my labor from start of the Pitocin to Carleigh's delivery. There were several other ones I picked too. Later before I left work I got copies of my ultrasounds put on a disc. I had that done in the department where I work (Radiology). I only had 3 scheduled ultrasounds but 2 of the 'just for fun' ones that we did later in my pregnancy got put in the system too when they were done so I had them on the disc too. I really like having all the images of her that were ever taken (besides at the MFM office I went to-I'm never stepping foot in there again). It feels really nice to have these records. *Edit* I got the idea about the records from my friend Holly who is Freja's mommy. Holly and I originally met through Diaperswappers and were in the same April due date club. Thank you Holly!! My friend Celia did something wonderful for me while on vacation. She wrote Carleigh's name in the sand in Myrtle Beach, SC. I am so grateful that she did this because I know it took a lot of work! Now I have another great page to add to her name scrapbook. Thank you so much, Celia!! Love you! Sweet Harley is now in Heaven. While my heart is joyous that she is in such a wonderful place and in no more pain, it is also breaking for her parents, Katie and Cameron, that they had to lose such a precious daughter. I never wanted them to have to experience losing a child. Harley was diagnosed with Alpers Syndrome. She fought this disease since March and so many were praying for her. She touched the lives of so many people along the way. You can read her entire journey on her CaringBridge page. Many of us moms, including myself, know Katie and Harley through Cafemom by the January 2008 babies groups. There is a balloon release scheduled for Saturday, August 29 at 1pm CST. It doesn't matter where you are or what you are doing. At that moment on Saturday we are all going to release a purple balloon for Harley. Below is a tag you can attach to the purple balloon. Take a picture of the balloon release and email the picture with the subject 'balloon release' to Ivy at sissygurl_02@yahoo.com. A collage of pictures of Harley and the balloon release will be created for Katie and Cameron by Amber. 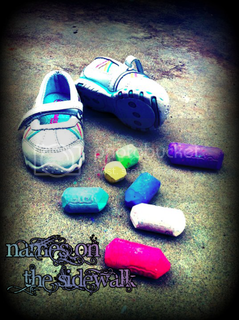 Photo created by and courtesy of Emily Johnson. Thank you to anyone who donated money towards Harley's shadowbox. All the money was raised and that is so wonderful! It has been placed on my heart to help and I would like to hold a raffle to raise money for expenses, both medical and funeral. Harley was in the hospital for many months and those bills can add up quickly. Now her parents will have to face funeral expenses too. I know I can only help just a little but at least it is something. 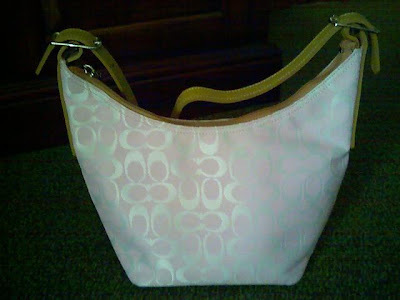 So what I am raffling off is a Coach purse. It is a light pink color. Each raffle entry is $1. You can either place the entries separately or buy all at one time. All money will go straight to my PayPal and at the end of the raffle I will be giving all money to Katie. The ChipIn ends September 4th and the winner of the purse will be announced the next day. I hope you will help me help Harley's family! Please click the above icon to learn more about Read With Us and how it works. At the beginning of Chapter 7, Lynnette says that like any other mommy would do, she asked God every day to let her little girl's problems go away but if she must have them then to make them less severe so she'd be able to live without much intervention. Well, I must not be like every other mommy because I did not pray for Carleigh to be healed. Not even once. I knew very well that God could heal her and if that was His will then I'd be forever grateful but I just could never bring myself to ask for that. I know that plenty of other people prayed for healing though. What I did pray for was that she could be born alive so we could spend some time with her living outside the womb. We obviously didn't get that but God is still good. When Lynnette was out one day with her mom she said, "I know why God didn't leave the boys here with me, because he knew that I could never handle a sick child." Lynnette gives us 2 verses to dispel the common "God will never give you more than you can handle" line. What do you think of these verses and how they relate to that line? I am so with Lynnette on the word 'birth defect'. I hate the word. I don't think my daughter was defective at all. I think she was perfect just the way she was. Although, like Lynnette, I have used it at times for lack of a better word. I prefer to use the word anomaly if I must refer to her anencephaly as something. Anomaly means deviation from the average or norm. I think it's really neat how Lynnette felt so in touch with God that one morning while reading scriptures. Have you had any moments in your life where you felt really close to God? 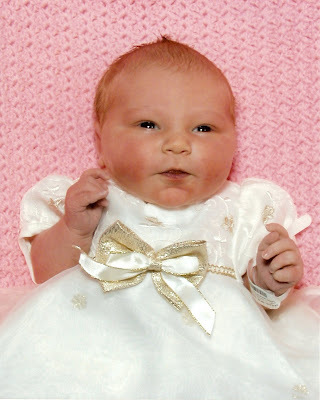 Tomorrow Mia gives birth tomorrow to her precious daughter Nevaeh Grace at 36 weeks via c-section. Nevaeh has been diagnosed with anencephaly like Carleigh. Please pray that Mia and her family gets precious time with sweet Nevaeh. It will be both a joyous and difficult time for them and I know that they will appreciate your many prayers. So please join me on your knees and lift up prayers on behalf of Mia and Nevaeh. 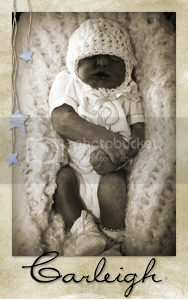 Please visit Mia's blog Our Anencephaly Journey and leave an encouraging word for her. I know she would like that. Nevaeh Grace was born this morning at 8:15 am. She lived for 59 minutes and went to be with Jesus at 9:14 am. She weighed 3lbs and 13.6 oz and was 15 1/4 inches long. A sweet little bundle of joy! Please keep Mia and her family in your prayers through this difficult time. Ever since that moment I found out I was pregnant with Carleigh I dreamed of having another girl. I was so excited when at 15 weeks I found out I was going to be blessed with another little girl. I had always wanted to have 2 girls close in age like me and my sister are. My sister and I are 14 months apart and I figured up that my girls would be 15 months apart. Perfect!! Finding out Carleigh wouldn't live crushed my dream. I was heartbroken. I wondered what Carleigh would look like and if she would look like her sister. 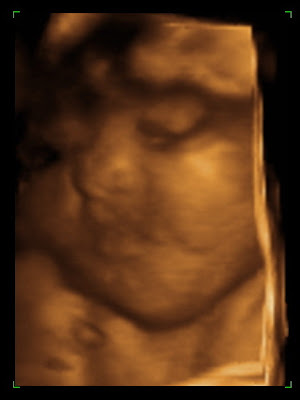 The moment I saw her on the 3D ultrasound I was stunned. All I could see was those cheeks! Those chubby cheeks! Kyndra had such chubby cheeks when she was born and here Carleigh looked like she would get them too. I began to imagine Carleigh looking like Kyndra when she was born. Daddy gets to have another girl that looks like him. Thanks for sharing, hun. Now, when Carleigh was born I didn't take the time to see who she looked like. I just enjoyed her. It's only later that I can reflect on who she looked like most. I can definitely see similarities between my girls. There are some things to take into concern though when comparing the two. Kyndra was 7 lbs and 19 in and Carleigh was only 3 lbs 15 oz and 13 in. Carleigh had anencephaly so her face/head isn't exactly proportioned how it should be so that can make it harder to see any similarities. And of course, Carleigh's coloring. Carleigh was born still and bruised. As time passed after her birth her skin became darker. Her coloring can make it harder to see similarities too. Considering all that. What do you think? Can you see the similarities? *Edit* I've had some people mention that they both had long fingers. Actually that isn't true! 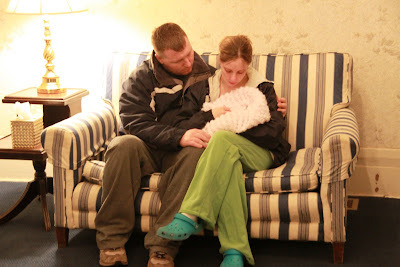 It may not look like it but Kyndra had short hands and feet with stubby fingers and toes. Carleigh was the opposite. Her hands and feet were long in addition to her fingers and toes. Carleigh's were definitely much longer than Kyndra's at birth. This was a difference I noticed right away because I was expecting them to be like her sister's. Kyndra's pic can be deceiving because she has her fingers curled. For the past 2 months I have been trying to meet up with Monica. I'm gonna bet that most don't remember who Monica is so I'll let you know. She works on the Mother Baby Care Unit at my hospital where I work and where I also got Carleigh's diagnosis and delivered her. Monica was my first nurse the day I went in for my induction and she is the nurse who has the most bereavement training and is in charge of that area. Monica asked how I was doing and I told her pretty well and we chit chatted a little more. I asked her what keepsakes they provided for families and we went over all that. I told her I wanted to be able to provide families with a baby book as that is something they may not know exists and regular baby books just aren't appropriate. 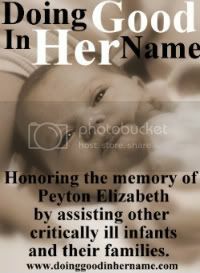 Let's face it, grieving parents do not want to flip through a baby book and see pages that will never be filled but should. That's just too hard. I told her about Kelly and Sufficient Grace Ministries and talked to her about the Dreams of You memory book and the Comfort Bear. I want to provide my hospital with these 2 keepsakes for as long as I'm alive and able. Monica was really interested in both of these keepsakes. She thought both would be things that families would want. She really liked the idea of the Comfort Bear. She knows how empty arms can ache. We talked about other things too. 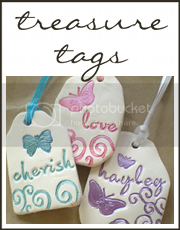 I was surprised to find out that there are families that do not want any keepsakes at all. No footprints, no pictures, nothing. I have a difficult time comprehending that as I can't imagine not having any keepsakes for Carleigh. Her keepsakes mean a lot to me. 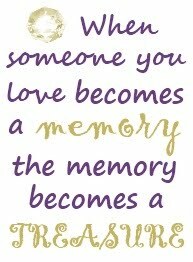 Perhaps that's because I never want her memory to fade. I guess some families just want to put it behind them? They have some keepsakes that are still waiting for the parents to pick them up. Monica said that they will keep them forever in case some time down the road the family would want them. I think it's great that they do that. Monica tried to get a support group going but it never really panned out. One person came once and that was it. I thought more people would want to be part of a support group but I guess not. I am certainly open to being a part of one if there comes a time when somebody shows an interest. I know it would be good for whoever needed it to have people there. I asked Monica if there were any other families that ever knew ahead of time that their baby was going to die. Apart from me, there has only been 1 and that family only knew right before they went in to deliver. After we finished lunch, we set that I would come up to the floor in a few minutes so that she could show me their 'angel cart' where they keep all the keepsakes. I'd also get to see the memorial quilt hanging in the hall. 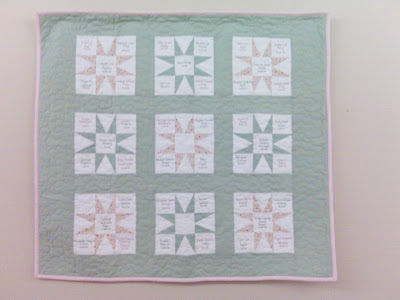 It's a quilt where parents can have their babies' names stitched on if they died. 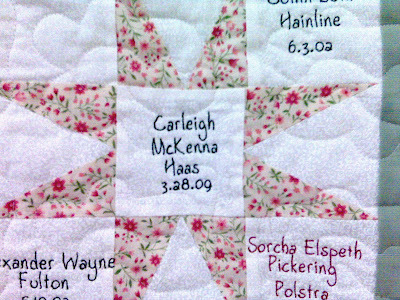 I had them put Carleigh's name on the quilt. So after I checked in with my department I headed on up to the unit and once I went through the doors I saw the quilt. So I went over and I looked at it and I found her name in the lower left corner. It's always good to see my daughter's name. After looking at the quilt for a few minutes I went to find Monica. I waited for a few minutes while she tended to a patient. It sure was a busy day for them up there! When she was able to spare a few minutes she took me down to the nursery to the angel cart. She showed me the memory boxes, baby bibles, impression kits, gowns, quilts, cards with the baby rings and lockets of hair. They have a great collection of stuff for families. I know I am thankful they had the impression kits as the one we had didn't work out at all. She said that they wanted to do more for me but I already had everything planned out and ready. lol Yeah, that sounds like me. :) I pretty much had every single detail planned out. We talked more about the memory book and comfort bear. I'm going to make sure they have at least 3 of each ready for families. She mentioned losses seem to come in three's. I've heard that before. When she asked about paying for the book and bear I told her that I would take care of it. It's something I want to do. After my visit on the unit I went back to my department and emailed Kelly about getting the memory books and bears. Kelly blessed me by telling me that she would give me the books and the bears I need right now at no charge. You are just so generous Kelly and I love you to pieces! I know that the families that will receive these special keepsakes will cherish them and be thankful. Later when I got ho me I got into Carleigh's keepsake tote so that I could get her prints to make a copy of them and I found my own comfort bear and memory book that Kelly had given me. The memory book is still not filled out but I will do that some day. I guess I don't feel really rushed since her small baby book has everything in it. I did pull my comfort bear out of the tote to keep out. I think I would like to snuggle with it and I don't know why I haven't done it before. So I snuggled with my bear while I read through Dreams of You and got teary-eyed. I wish I didn't even have to fill the book out but I also know that had I not walked this road the good things that have and currently are happening might not have happened at all. 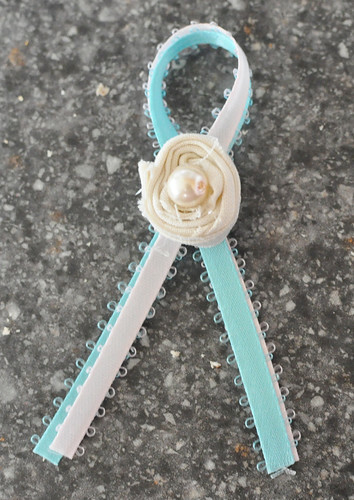 Walking With You was created by Kelly of Sufficient Grace Ministries to help support those who have lost a child. Together we share our stories, helpful information, scriptures, encouraging words, prayer requests, and more. To join in on Walking With You please visit Kelly's blog. This week, Kelly is sharing some commonly asked questions and answers about grieving the loss of a child. The rest of us may blog about a similar topic or share what is on our hearts this week. I think I'd really like to share some on 2 loved ones who have done a lot for me on this journey. These 2 people are my Aunt Becky and my Uncle Buck. Not even a month after Carleigh's diagnosis I received his first writing. This first writing was titled A Mother's Love. He sent me a second writing after Carleigh's birth titled I Think I Saw A Miracle. Together, Aunt Becky and Uncle Buck created a masterpiece called Carleigh's Toy Box. It was a total surprise and it's very special. Uncle Buck also spoke at Carleigh's service and gave a sort of Eulogy. Just a few days after our diagnosis before we left for our family vacation to Hawaii, they blessed us with a beautiful portrait and a letter. 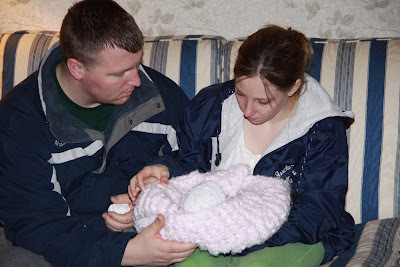 Both of them came down the day of my induction for Carleigh and stayed the entire time. That meant a lot. 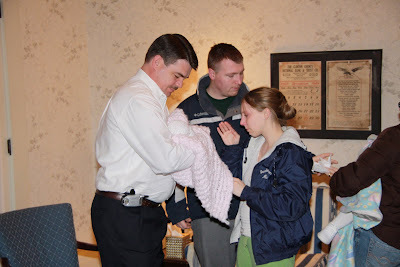 They didn't come into my room much and they saw Carleigh for just a little bit but never got to hold her. They helped watched Kyndra and my niece Audrey and were there to support the whole family. Aunt Becky was one of the few people in the family to feel Carleigh kick inside my womb. (The only other person outside of my immediate family was my Aunt Sherry.) I really think that being able to feel those kicks is a special gift because they will never be felt again. How I miss those little kicks! My aunt and uncle are also making a memory box to put all of Carleigh's keepsakes in. I know it will be so special and very beautiful. It believe it will be made out of a type of oak and lined with cedar and stained with a darker finish. I can't wait to see what it will look like! This was kinda random and here and there but I wanted to be able to share their hard work and my uncle's writings with those that recently started following Carleigh's blog. Back when I shared them, I did not have as many followers as I do now. I hope you will take a little time to read and enjoy them if you haven't already. I know I have read them many times. I hope they move you like they have moved me. Thank you Aunt Becky and Uncle Buck for your love, your comfort, and your support. We love you. This will be a short one from me this week (sorry) as I'm tired, hungry, nauseous, and my teeth hurt (had a visit to the dentist). I hope all you ladies reading along will pick up the slack for me. Love you all. In this chapter Lynnette shared about Kyle's business venture and how it didn't quite work out as hoped. How many things in life don't go as we have planned? I can definitely say that there are paths and outcomes that I never planned or imagined would happen in my life. But God has used both the good and the bad. Are there things in your life you imagined different? I hope that I make all of my friends know how much they mean to me. I believe I am a loyal friend. Just call on me and I am there. When I give you my word I try my hardest to keep it. I'm sure there are times when I haven't been a good friend and I am sorry for that. Where we live I don't have a lot of IRL friends. I have my Lindsey and I'm so grateful for her. She's definitely my best friend. Lindsey, you are a wonderful and beautiful friend and woman and I'm so glad that God brought you in my life. You make work fun and I'm glad we can share so many parts of our lives together. I know that I can share anything with you. I don't know if you'll ever read this but I love you and thank you for being my friend! It's been awhile since I last posted about the days surrounding Carleigh's birth so I thought I would finally post the next thing. 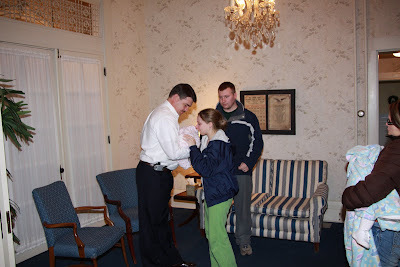 We arrived at the funeral home after leaving the hospital. The drive wasn't nearly long enough. I remember just wishing we could drive home and not even go to the funeral home, but I knew it was something we had to do. I stayed in the car as long as possible until Anthony came and got me out. This picture always gets to me. It looks like there isn't any life in my eyes. I look empty. We made the slow walk inside and had a seat on one of the couches. 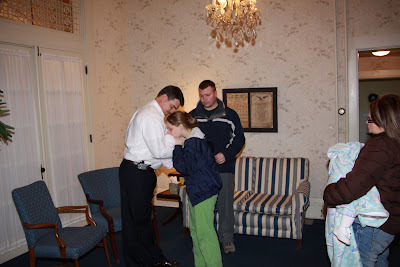 One of the funeral directors, Craig, gave us as much time as we needed and I'm so glad we weren't rushed. We just sat there as I held her and we gazed at her and kissed her and told her we loved her very much. In this photo if you look close enough you can see a single tear on my face. I reluctantly stood up. I knew it was time to hand her over. This is the part I was dreading so, so much. Handing her over was the absolute worst. It was the hardest part in the whole journey for me. After she was gone from my arms I broke down. Anthony held me as I sobbed and he held me up as we walked out and we drove home. The pain from that moment will always be with me. When I think about it I can't help but shed tears remembering how much my heart broke. And it really, truly felt broken. I wanted to let everyone know of a sale that Sue is having at My Forever Child right now. You can view more about the sale on the My Forever Child blog but I will tell you that they are 20% off right now! I got one for Anthony for Father's Day to put in his work car. He really liked it. I've been wanting to get one for my van but haven't yet and now is the perfect opportunity for me to do so! Hooray! Ride 4 Grace, stamping, and more!! !